A large project we hope to undertake very soon in my organization (Minnesota State Colleges & Universities) is in the area of Business Intelligence and Analytics. I believe Analytics has the potential to fundamentally transform how we manage higher education. While the commercial sector is aggressively pursuing this capability to gain competitive advantage, higher education still lags behind. A good starting point for coming up to speed on Analytics is the excellent book Competing on Analytics by Tom Davenport and Jeanne Harris. Davenport and Harris define analytics as ""the extensive use of data, statistical and quantitative analysis, explanatory and predictive models and fact based management to drive decision and actions". 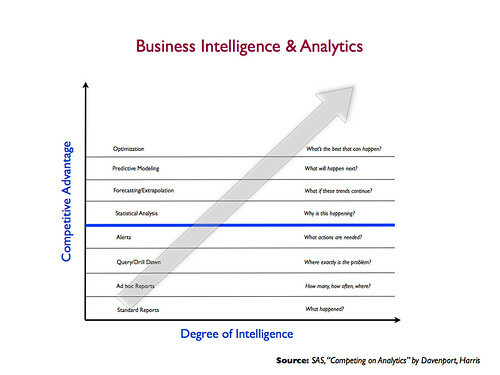 I have found the following chart (in Davenport, Harris but derived from SAS) very helpful in understanding the ladder of capability as one moves from basic reporting to true analytics. As reported in Datamation ("Oracle's Smarts for Small Businesses") Oracle has announced a new BI suite aimed at small businesses. SE One " includes Oracle's Database 10g Standard Edition One, as well as the Oracle Business Intelligence Server for churning metadata and Oracle Warehouse Builder 10g, which ensures data quality and auditing and relational and dimensional modeling. Mindful that SMBs typically have small or no IT departments to help them install and configure software, the system employs business user interfaces that do not require coding or other technical skills, said David Planeaux, director of BI product marketing for the company." You will probably still need an Oracle DBA. No? Or are Oracle databases now self-supporting and self-tuning? I will follow-up with Oracle to see whether this product is available for higher education.